For a brief period, Pierre Blot was perhaps America’s first celebrity chef. He styled himself “Professor of Gastronomy.” He wrote cookbooks and ran a cooking school. Ultimately, he may have made a basic marketing error, though, of trying to teach upper-class ladies about food preparation at a time when they simply wanted their servants to learn how to do it for them. Blot was born in France c. 1818. He arrived in America in the 1850s as a “political refugee” (according to the New York Times, 7 April 1865.) He couldn’t speak any English upon arrival, so he taught French for a living for a time. It appears, though, that he quickly taught himself English to get ahead. 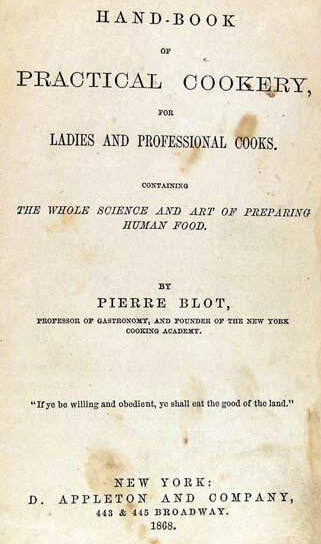 1863 — Blot published his book “What to Eat and How to Cook It” (New York: D. Appleton & Company.) The book contained over 1,000 recipes. On the title page, he described himself as formerly the editor of the “Almanack Gastronomique” of Paris. 1865 — In March, Blot opened the New York Culinary Academy of Design on Fourth Avenue. He ran three courses, each running twice a week for ten weeks. One of the courses was for servants, the other two were for “ladies.” The New York Times gushed about him and his cooking school. 1866 — During May and June, Blot gave lectures in Boston. 1866 — His second book was published: “Professor Blot’s Lectures on Cookery, Delivered at Mercantile Hall” (Boston: Loring, Publisher, 1866.) In the same year, Blot closed the cooking school in order to focus on lecture tours. 1871 — His star started to fade; his directions and recipes were criticized as over-elaborate and useless. In fact, the wealthy that he thought were his market weren’t ready yet to do all this work themselves in the kitchen. That would have to wait until the advent of “foodies” starting in the 1980s. For instance, in “Practical Cookery”, he writes: “you may make, with common white note-paper, as many little square boxes as you have mushrooms to broil; grease them with butter, put the mushrooms in, set them on the gridiron, and on a moderate fire, and serve them in the boxes when done.” His readers wanted servants to do the work; but their servants (often poor Irish immigrants straight from tiny backwater villages) weren’t educated enough to understand what Blot was teaching. 1874 — Blot died 29 August 1874 in Jersey City, New Jersey. 1863. What to Eat and How to Cook It.